Providing quality, patient-centered nutrition care is the main priority of dieticians working in clinical settings. Within the last decades there was a development of numerous new fields of work for clinical dieticians, including enteral and parenteral nutrition as well as the challenge integrating current evidence-based findings into daily work. To ensure continuous improvement of ongoing processes, a quality management system is crucial. This systematic approach leads to high quality nutrition care and in further consequence patient safety. Therefore it was the aim of the Department of Dietetics and Applied Nutrition (University Hospital Graz) to implement a quality management system and the certification through an official accreditation organization (qualityaustria, ISO 9001:2008) . Introduction of the quality management system was realized in the time period between July 2010 and April 2011 with support from the Department of Quality and Risk Management. A project agreement was signed with the hospital management. Furthermore, a project plan including mile stones and deadlines was developed. Main priority of the project was the introduction of consistent terminology as well as the definition of standard operating procedures (SOP), standardized nutrition intervention guidelines (DBL) and counselling documents. All processes were defined considering the Austrian Nutrition Care Process  which is based on the American Nutrition Care Process [3, 4]. Within the accreditation procedure the core processes of nutrition care (dietetic ward rounds, nutrition therapy, nutrition counselling, food service management) were defined as standard operating procedures (SOP). Evidence-based standardized guidelines were developed for safe, effective and patient-focused nutrition care. All counselling documents were validated through the University of Applied Sciences - Department of Dietetics and Nutrition. All processes are implemented through the collaboration-system "Microsoft SharePoint" and available for all dieticians in the latest version. To maintain high quality nutrition care it is essential to measure outcomes as well as subsequent improvements. Therefore annual reviews of effectiveness and efficacy through key performance and outcome indicators are performed. At the end of each year a management report is published. All documents are reviewed at least every two years. The introduction of a structured quality management system including certification through an official accreditation organization showed clear benefits. A standardized language was implemented and transparent processes were developed for all fields of dietetic and nutrition care. With regular reviews of effectiveness and efficacy high quality and patient-centered nutrition care can be guaranteed. The documents developed are basis for all interventions and decisions; it supports evidence-based working and improves patient safety. 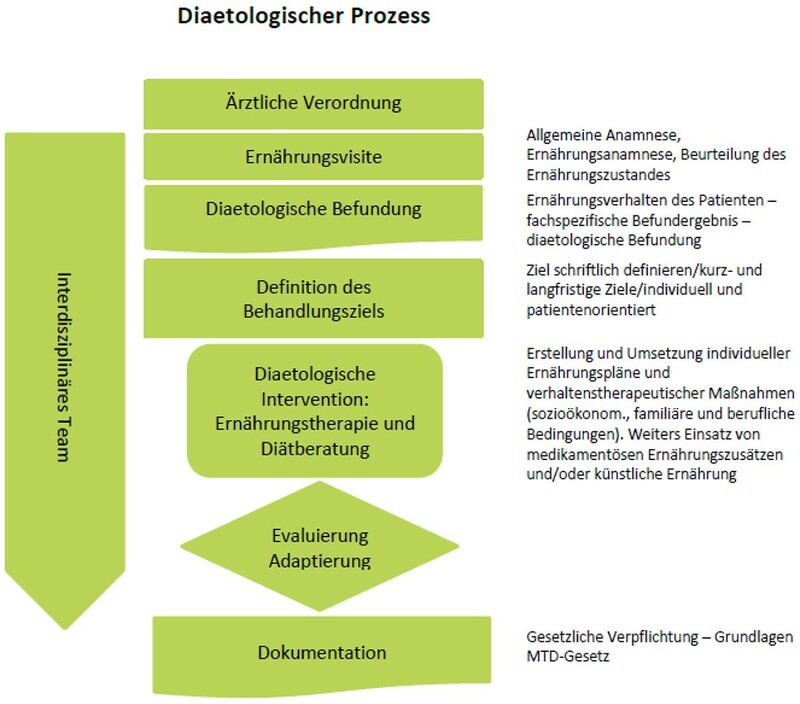 The original Austrian "Dietician Care Process" (viewed June 6 th 2015 http://www.diaetologen.at/diaetologie/diaetologischer-prozess/).